ATLANTA (AP) — Officials in Georgia called in the cavalry Monday after dozens of cows escaped when a tractor-trailer transporting them overturned on a busy junction north of Atlanta. The truck carrying 89 cows overturned around 3 a.m. on the cloverleaf of Interstate 75 and I-285. Many of the cows scattered, causing wrecks and clogging rush-hour traffic. 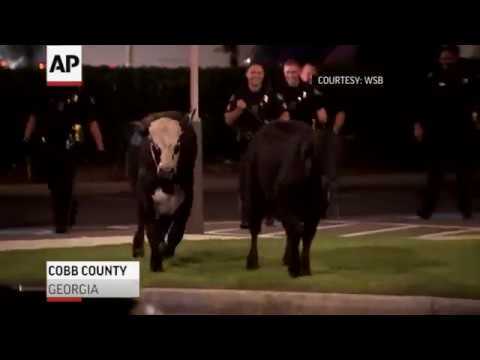 “We’re wrangling some cows, that’s what we’re doing,” Sandy Springs Police Sgt. Sam Worsham said. The effort to round up the herd included real cowboys, the Georgia Department of Transportation said. Cobb County Police Sgt. Wayne Delk said 87 of the 89 cows had been accounted for by Monday afternoon. Ten cows were killed, and two were still missing. Some roads in the area were closed for a time but had reopened late Monday morning. Sandy Springs police dealt with four wrecks caused by the wandering cows, Worsham said. No one was injured in any of those accidents, although several cows were hurt and some had to be tranquilized as officers tried to corral them. Cobb County animal control brought a horse trailer to the area. Officials hastily erected metal barriers to corral the cows and then guide them into the trailer. Delk said the captured cows were being prepared to be shipped to a facility in Calhoun. Delk said investigators do not think speed was a factor in the crash. The driver of the tractor-trailer that was carrying the cattle was taken to a hospital with injuries. The driver’s name has not been released. It’s the third such accident this year outside Atlanta, and the biggest yet. Smaller herds spilled onto Interstate 75 in May and Interstate 285 in June.